I have quite a few bulbs and am looking to fund another fan shaped brush. As of right now, I have to say that my Chubby 2 2-Band is my best brush overall. It's the perfect balance for me - uber soft, superb flow, medium-high to high density, hybrid/fan shape, great handle. I love it. As for the rest of my collection, I can say I enjoy my Thaters, M&F Emillion and Kents equally. They're all fantastic and have unique characteristics. I try and avoid monotony in my collection - yet I have two 'duplicates' of the same model. What do you suggest? Having no scritch is a requirement*. That's where my dilemma comes in. Thank you all for your opinions! Feedback welcome. The problem is hair batch variance. It seems like the only consistent "gel"-like, curled tip shaving brush manufacturers out there are Simpson and Thater... to my knowledge. You have an awesome brush collection. I would suggest getting a handle custom made by one of the artisans and getting a WSP Superfine knot in a size 26 set at 52mm. That is one of my brushes (made by Rudy Vey) and I have kept it through thick and thin. Gel tips, medium density, excellent flowthrough but great back bone. I have not found its equal yet. I imagine 28mm would be awesome as well. I want to make sure it'll be super soft . I love mine. The only brush I have that is softer overall is my Kent Bk8, and not by much. But my custom has much more backbone. I find my friend Celestino is right quite often about brushes!! I'm just worried about the current batch vs the ones you have. How long ago did you make this brush? Hair batches usually vary quite a bit and WSP is new in the game. Any ideas if the hair has remained the same or changed over time? A Manchurian is out of the question? Simpson 2-Band has zero scritch. Thater zero scritch. M&F Heritage (this particular batch) zero scritch. (04-04-2014, 09:02 AM)bmilcs Wrote: I'm just worried about the current batch vs the ones you have. How long ago did you make this brush? A good point. I had this brush made about 13 months ago. I think a good bet would be to get in touch with Celestino as he is very familiar with the WSP knots. Or you could talk to Lee at WSP directly and ask how the current batch compares to the ones 13 months ago in the Superfine knot. I would talk to both really. FYI. I didn't get the stubby extra stuffed knot. I prefer more flowthrough with the medium density regular knot version. Mine definitely has the gel tips and 0 scritch, I can vouch for that. I hate scritch. (04-04-2014, 09:31 AM)bmilcs Wrote: Say what? Well, that's not my experience with my CH2 2-Band, but that's beside the point. So you don't like scritch or scratch, but enjoy scrub, is that it? Simpson Chubby 2 Three-band Super. Super soft, no scritch, dense, pillow like. (04-04-2014, 10:54 AM)MikeDDS Wrote: Simpson Chubby 2 Three-band Super. Super soft, no scritch, dense, pillow like. Dude you're probably right. I had a CH2 3-band and I miss it. It'll be a proper addition to my collection of 2 Kent's, 2 Thaters, eg. Just be aware that the NEW batch of Simpson super 3 band hair feels more like Simpsons Best based on my own and Celestino's experience. The older batch of Super 3 bands was much, much nicer. Does it? I'll have to look for an older one. (04-04-2014, 11:01 AM)bmilcs Wrote: Does it? I'll have to look for an older one. Thats what I would recommend. If you want a Simpsons brush. 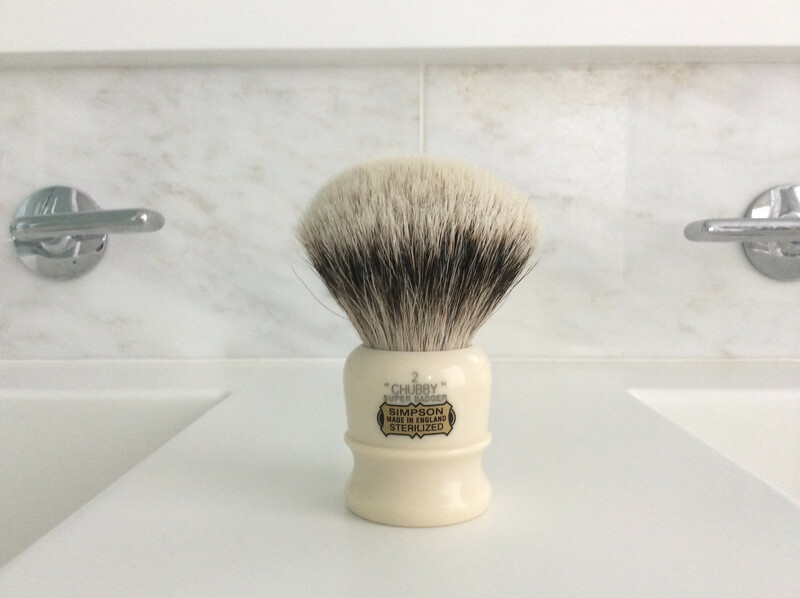 Have you thought about a Shavemac Silvertip D01? I'm mostly a 2-band guy myself but I enjoy a nice, well stuffed 3-band. Shavemacs are hard to beat in that regard. You can choose from a wide variety of handles, materials, knot sizes. Also you can choose knot shape and loft height. Interesting to hear scritch being mentioned in connection with Simpson 2 Band. As far as I know all batches since late 2011/ early 2012 have been very consistent pillow soft tipped batches. Only previous have been known to be hit and miss - before Simpson consolidated vendors. Mine is from 2013, and initially I did feel some scritch, but then it subsided to scrub, which is what I currently feel. Of course, and as always, YMMV. That being said, when I bought it and started using it I was mainly into Silvertips, and anything other than that was not my first choice. Nowadays I'm leaning more and more to 2-Band hair, although I still firmly believe variety is the spice of life. (04-04-2014, 04:31 PM)German Wrote: Interesting to hear scritch being mentioned in connection with Simpson 2 Band. As far as I know all batches since late 2011/ early 2012 have been very consistent pillow soft tipped batches. Only previous have been known to be hit and miss - before Simpson consolidated vendors.